When Nissan released its GT-R, buyers soon discovered that using the vehicle's launch-control feature led to a blown transmission and voided warranty. One owner started a class-action lawsuit and prevailed, but the rest may get screwed. Here's the official settlement. The GT-R transmission issue was discovered in late 2008. Drivers were turning off the standard Vehicle Dynamic Control (VDC, or Nissan's version of electronic stability control) to activate a "launch control" feature that allowed for quick off-the-line starts. The feature, which was designed into the car, often resulted in a broken gearbox and a warranty that Nissan refused to honor — the company considered turning VDC off to be necessary only when trapped in mud or snow. If you tried to deny your Nissan dealer access to your vehicle's data-recording black box, your warranty would still be voided. 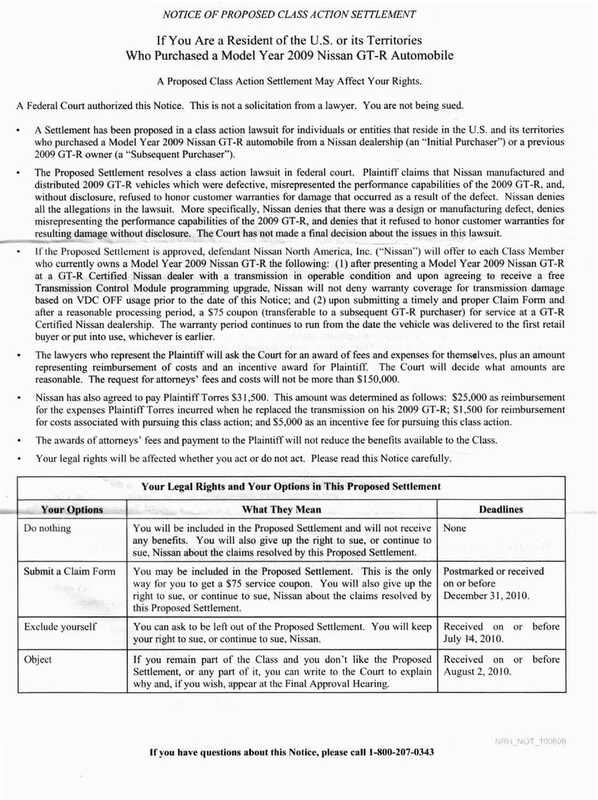 A class action lawsuit resulted; although Nissan admitted no wrongdoing or design problems (or ever having denied warranty claims), the company settled it by agreeing to give qualifying owners a transmission programming upgrade and a $75 coupon for service at a factory-authorized dealer. It also agreed to pay the case's original plaintiff $31,500 to cover the cost of the replacement transmission he purchased, as well as legal fees and $5,000 for pursuing the action. This is great news for the guy who originally sued and good news for anyone who has yet to destroy their GT-R's transmission. If you're one of the unlucky individuals who blew up a gearbox that wasn't covered under warranty, your options are limited to sucking it up or sending in a letter excluding yourself and suing on your own. If you do nothing, you're de facto included.